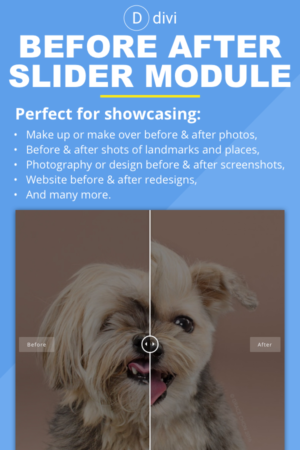 Showcase your before & after photos in an awesome unique way with this easy to use Divi module. This Divi Module is fast and responsive, and it will adjust depending on your screen size. What’s more awesome is that it works blazing fast in mobile devices and becomes a touch and drag slider. It also works with Extra theme too as that uses Divi Builder as well. A creative one page profile divi layout is added to the bundle now for existing & new customers. This layout also demonstrate how creatively we may use this module with in Divi’s Tab module. Have a look at demo here there is also detailed installation instructions added in the readme.pdf file. Download and extract the main zip file and that will further give you 2 zip files in it and 1 readme.pdf file. Please read the readme file which provides all the details and installation step by step instructions for the plugin and layout.